SchoolNomics™ is like a "return on investment calculator" for educational spending. Traditional reports only show who controlled the money. A SchoolNomics analysis shows who benefited. In$ite®: A patented system for analyzing school finances. 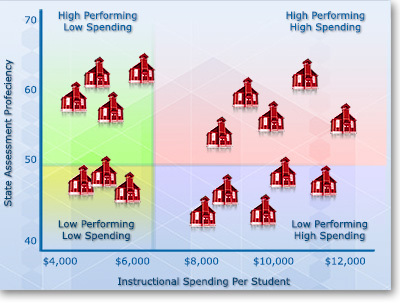 Key Performance Indicators: A cost analysis of student performance data. Uniform Chart of Accounts (UCOA): Granular cost reporting. Three states have been using In$ite for more than 15 years: Nevada, South Carolina and Rhode Island. Rhode Island added the UCOA in 2010. To explore the core services of SchoolNomics, call 1 (800) 748-6696 ext. 136 or send an email to schoolnomics@edmin.com. The first step in spending education dollars wisely is to have a true understanding of how those dollars are being spent. SchoolNomics provides an easy-to-understand way to look at the effectiveness and efficiency of school succcess, based on a patented financial model. You receive services and data for an analysis that shows cost/benefit relationships at each school and program level. Spending is reported both on a per-pupil basis and as percentages of your total expenditures. When Rhode Island published its first UCOA data, a blogger at the Thomas B. Fordham Institute praised the state's accountability, saying "District budget directors and community members alike now have a powerful tool for finding inefficiencies and pushing for spending that is better-aligned with their most important priorities for K-12 education."